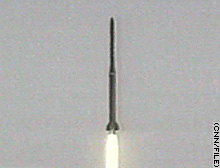 This image shows a North Korean missile being tested in 1998. White House says North Korea may have tested short-range missile. Washington was quick to react to the apparent missile test. Are you concerned by N. Korea's apparent test-firing of a missile? WASHINGTON (CNN) -- North Korea apparently tested a short-range missile Sunday, the Bush administration said, the latest in a string of recent incidents to refocus international attention on the Korean Peninsula's nuclear standoff. "It appears that there was a test of a short-range missile by the North Koreans and it landed in the Sea of Japan," White House Chief of Staff Andrew Card said on CNN's "Late Edition." Also Thursday, a Defense Department intelligence official said North Korea has the "theoretical capability" to arm a missile with a nuclear device and strike the United States. Card said Sunday that the White House was "not surprised" by the apparent missile test. "The North Koreans have tested their missiles before," he said. "They've had some failures"
Six-nation talks on persuading North Korea to curb its nuclear ambitions -- involving the two Koreas, the United States, China, Japan and Russia -- have been stalled since last June, after three inconclusive rounds. "We have to work together with our allies around the world -- especially the Japanese, the South Koreans, the Russians and the Chinese -- to demonstrate that North Korea's actions are inappropriate," Card said. "We don't want the Korean Peninsula to have any nuclear weapons on it." North Korea has said it will stay away from the nuclear talks until Washington apologizes for comments U.S. Secretary of State Condoleezza Rice made in January, when she described the communist state as one of the world's "outposts of tyranny." Resuming the talks gained urgency in February when North Korea said it had developed nuclear weapons and would boycott the talks indefinitely. The North has since threatened to increase its nuclear arsenal and has demanded that the United States drop what it calls a hostile policy. Sunday, Card described Kim as "not a good leader." He said North Koreans "are living in poverty -- many in concentration camps. They do not have any exercise of democracy or freedom. They are not allowed to contact the outside world. [Kim] is not the kind of leader that is comfortable with the rest of the world." On NBC's "Meet the Press," Card portrayed North Korea as a target of U.S. efforts to inspire democracy around the world. "We're doing everything we can to make sure that the people of North Korea recognize that they're being cheated and denied opportunities that come with freedom and democracy," he said. U.S. State Department spokesman Curtis Cooper issued a statement saying the missile test apparently took place Sunday. "We are continuing to look into this," Cooper said. "We are consulting closely with governments in the region. We have long been concerned about North Korea's missile program and activities, and urge North Korea to continue its moratorium on ballistic missile tests." Sunday's test came one day before the opening of a nearly monthlong United Nations conference on the nuclear nonproliferation treaty. The U.N. convenes the meetings once every five years to review developments under the accord, from which North Korea withdrew in January 2003. North Korea tested missiles in 2003, and in 1998, it test-fired a missile over Japan into the Pacific Ocean. Japanese officials had no immediate response to reports of Sunday's test. But it is likely to have the biggest political impact in that country, said an international security expert from Harvard University. "It's going to make the Japanese nervous," Jim Walsh told CNN on Sunday. "And it's going to put pressure on the Japanese prime minister." Sen. Carl Levin, the top Democrat on the Armed Services Committee, said on "Late Edition" that Sunday's test shows the Bush administration's refusal to hold direct talks with Pyongyang is leading to an even greater nuclear threat. The test, Levin said, is "additional, very discouraging evidence that this administration's policy towards North Korea is failing. We've had a lot of other evidence in the last four years -- the fact that they have renewed their reprocessing program of plutonium; the fact that they're now enriching uranium; and the fact they apparently can now put a nuclear weapon on a missile." Last week, U.S. Defense Intelligence Agency Director Lowell Jacoby testified on Capitol Hill that, according to a U.S. assessment, North Korea has the capacity to arm a missile with a nuclear device and hit U.S. territory. Such a "two-stage" missile is "assessed to be within their capacity," Jacoby said in response to a question from Sen. Hillary Rodham Clinton, a New York Democrat. The Pentagon later argued that Jacoby was not stating new information but only reiterating his previous statements that North Korea has a "theoretical capability to produce a warhead and mate it with a missile." "We have no information to suggest they have done so," Pentagon spokesman Bryan Whitman said in a statement Saturday. Walsh said North Korea has never successfully tested a long-range missile or a nuclear device -- much less a combination of the two. "We are very, very far from that point," he told CNN. But Levin argued that the danger North Korea presents is mounting. He pointed to an official moratorium on missile testing "that the North Koreans imposed on themselves" toward the end of the Clinton administration "when we were talking directly to the North Koreans." In addition to the multilateral talks, Levin said, the Bush administration should "talk directly to the North Koreans. That's what's been missing. ... The nuclear threat is increasing from North Korea as a result." But Sen. Norm Coleman, a Minnesota Republican on the Foreign Relations Committee, said North Korea lied to the United States in the bilateral talks during the Clinton presidency. "On the one hand, we thought we solved the problem, and they were picking our pocket with the other hand, developing nuclear capability," Coleman told CNN on Sunday. "It's not that it's impossible to negotiate with them, it's that it's worthless to negotiate with them because Kim Jong Il is a petty tyrant." Multilateral talks could make a difference because "China has some leeway on North Korea," Coleman said. "If you bring enough people in who have a stake in what happens, those in the region, you got a better chance of getting something done." Levin countered that China and South Korea want the United States to hold bilateral talks in addition to the multilateral negotiations. Sunday's test "was a political act, not a military act," Walsh said, calling it "an attempt to put pressure on the United States, to try to get them to come and talk to the North Koreans." During his televised news conference Thursday, Bush insisted the six-party talks are working and are the best way to solve the dispute. "The best way to deal with this diplomatically is to bring more leverage to the situation by including other countries," he said.